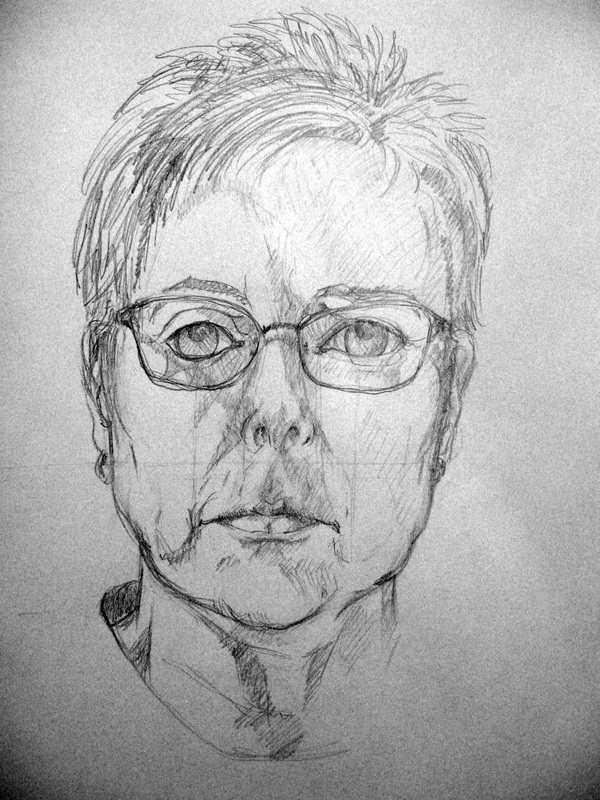 We just completed our fall beginning drawing class. 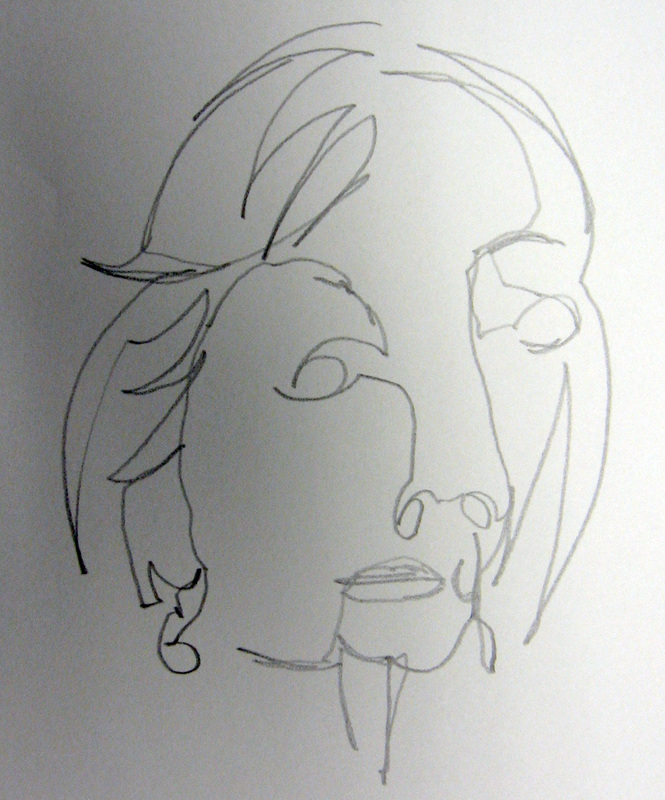 We began with blind continuous line drawing. 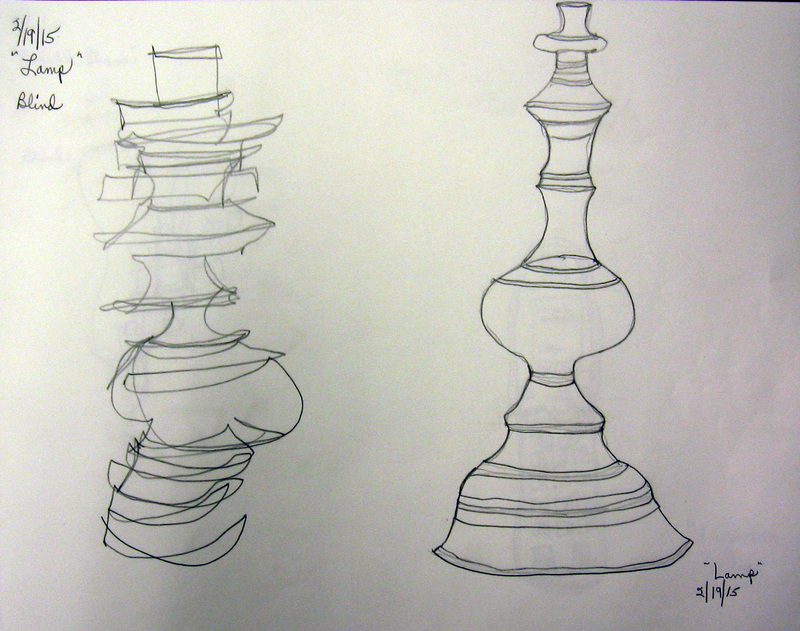 We studied and drew objects that had negative space that helped define their shape. 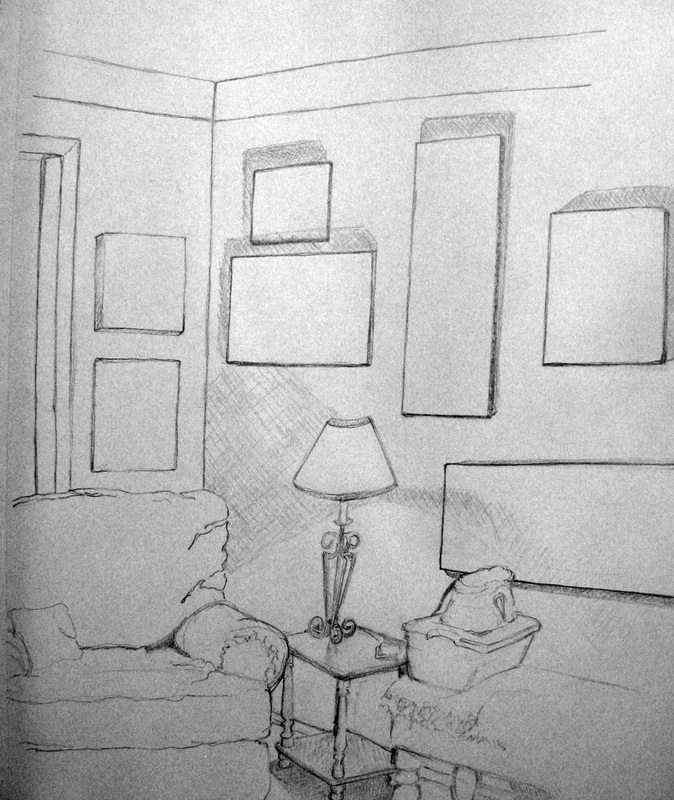 We studied perspective and drew interiors. We practiced all our skills the last night of class using an Elegant Writer” calligraphy pen to create a line a wash drawing. If you would like to view more examples of their work click here. Thank you to all the students who agreed to share their work here! I am still working with the elegant writer calligraphy pen. I introduced this pen as a drawing medium, recently, to my last beginning drawing class. 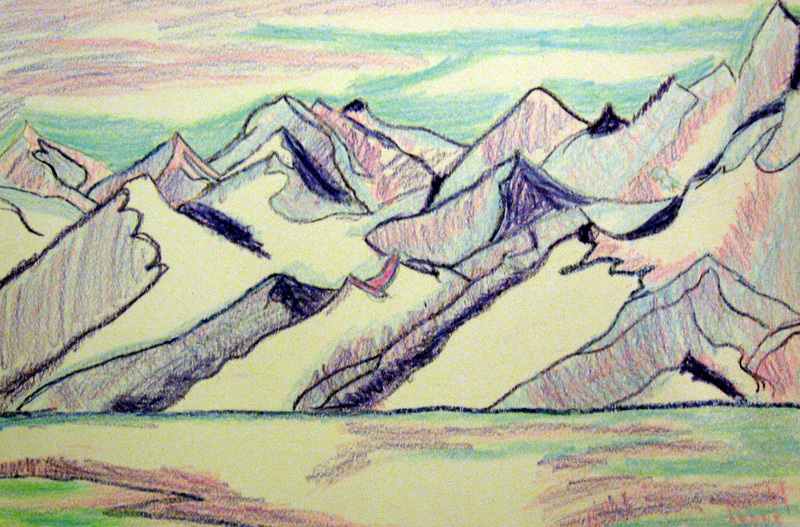 I think it is excellent as a drawing tool as well as fun to use with watercolor. 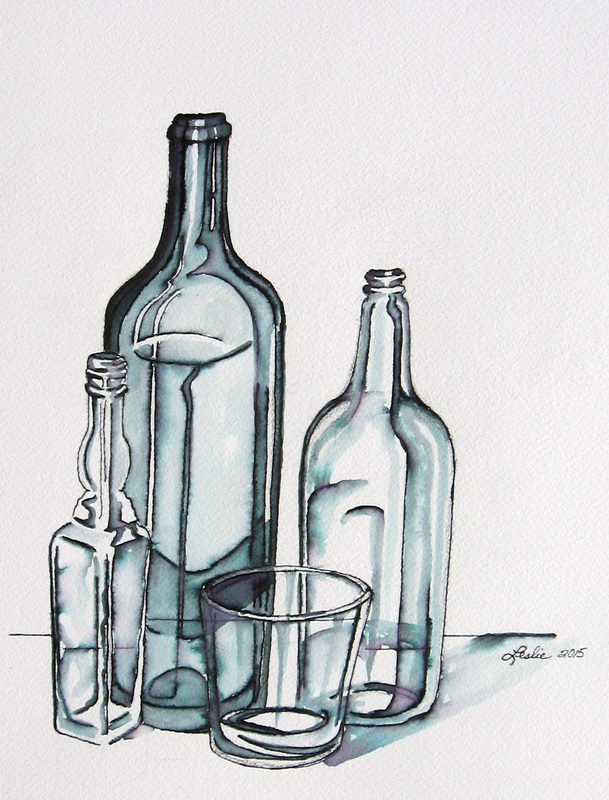 Here, I have used it to draw a still life of clear glass items. Click here for an explanation of how you can use this pen for drawings and watercolors. 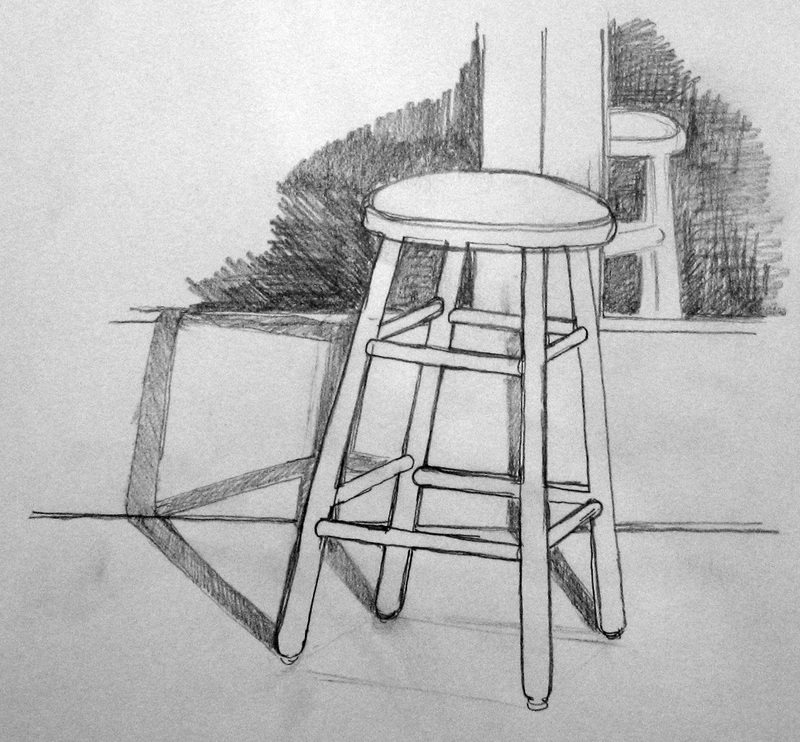 I just finished teaching a six week class of beginning drawing. 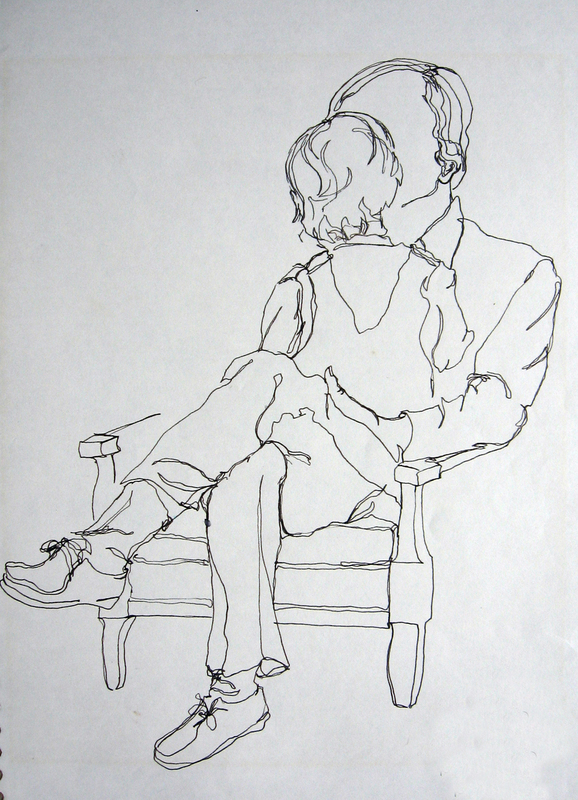 I have posted a selection of drawings on a page that you can reach by clicking here. Thank you to all the students who contributed their work to this post and the attached page. 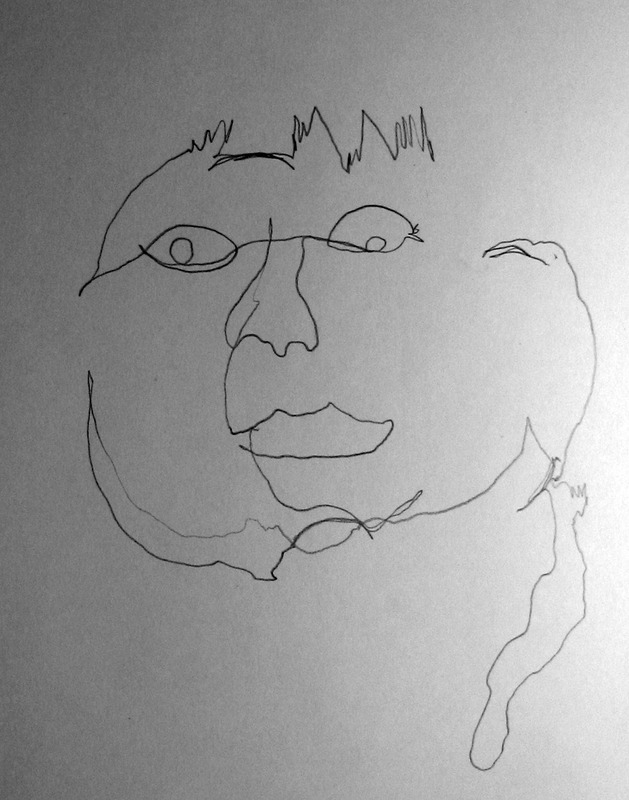 We worked on blind continuous line and looking continuous line drawings. 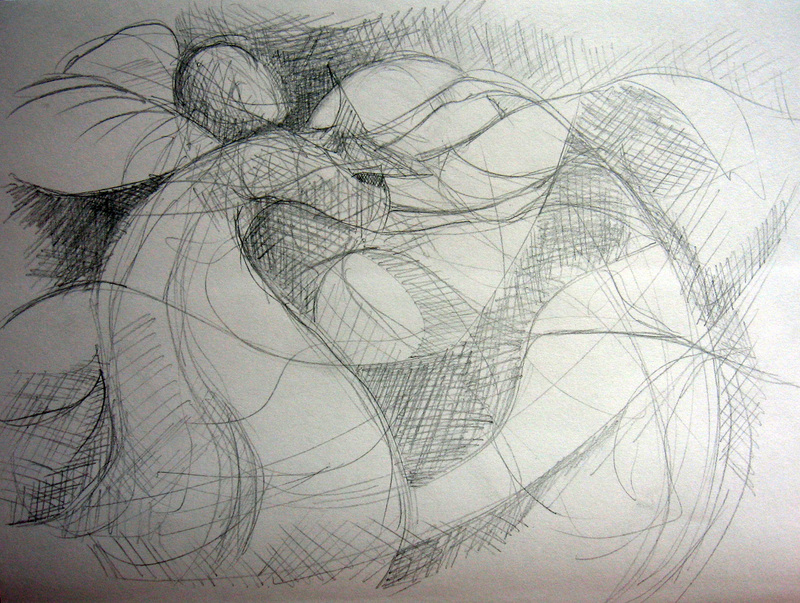 The students were asked to feel the form of what they were drawing. We did this with hands and apples and self portraits and they practiced with other objects they found around their home for homework. 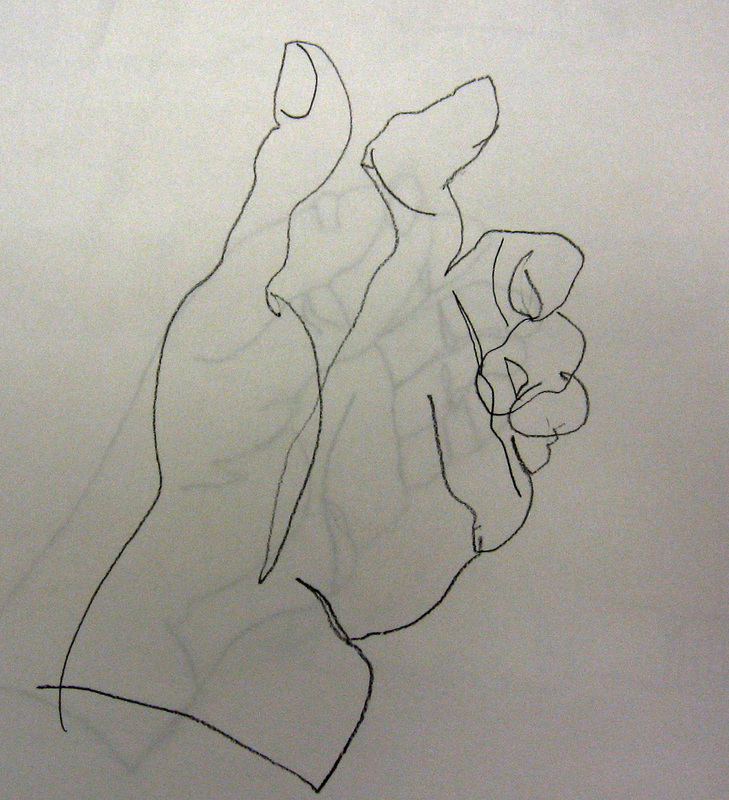 We discussed and practiced cross contours, not just the outlines of things we were studying. 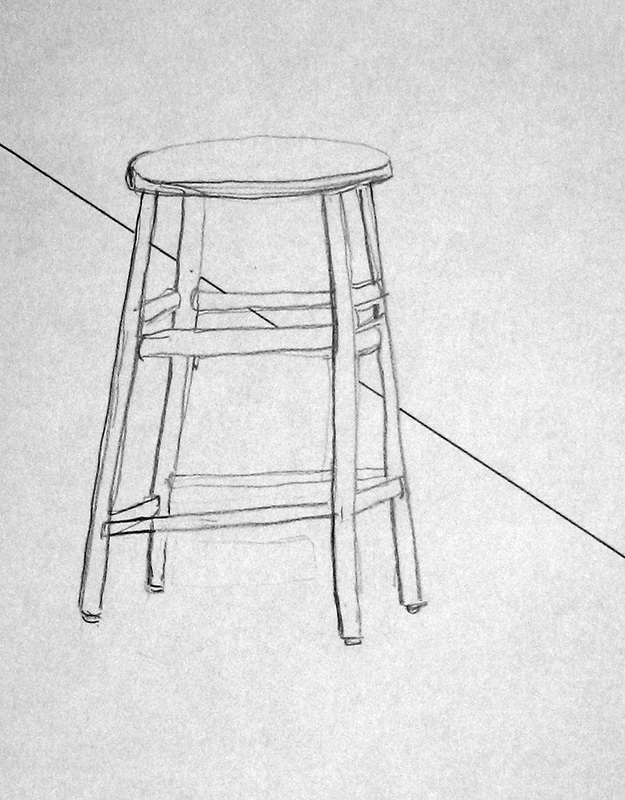 We studied negative space and drew the shapes we viewed between the legs and supports of a stool in order to find the positive shape of that stool. 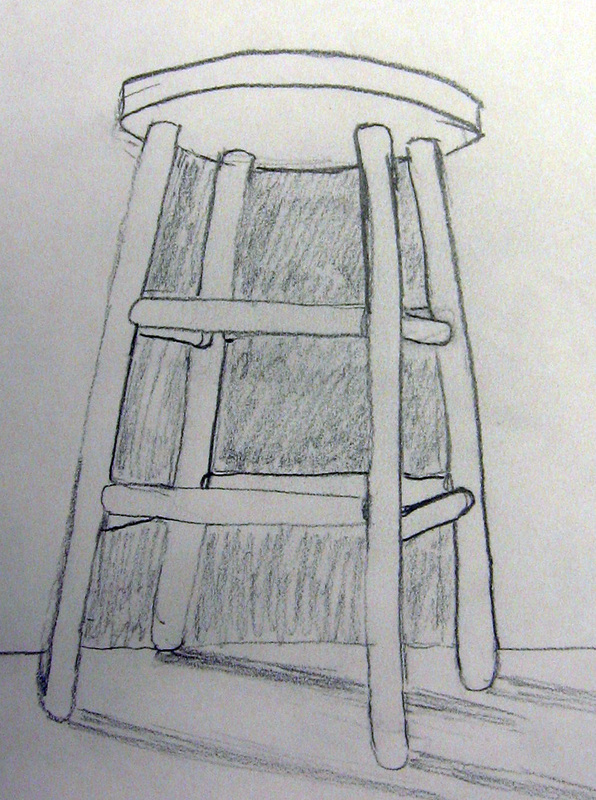 Drawing the shapes between the edges of the leaves of plants and slats on a chair are good for practice seeing negative space and shapes. We learned to measure shapes and to determine angles with our pencils and how to translate them onto our page. 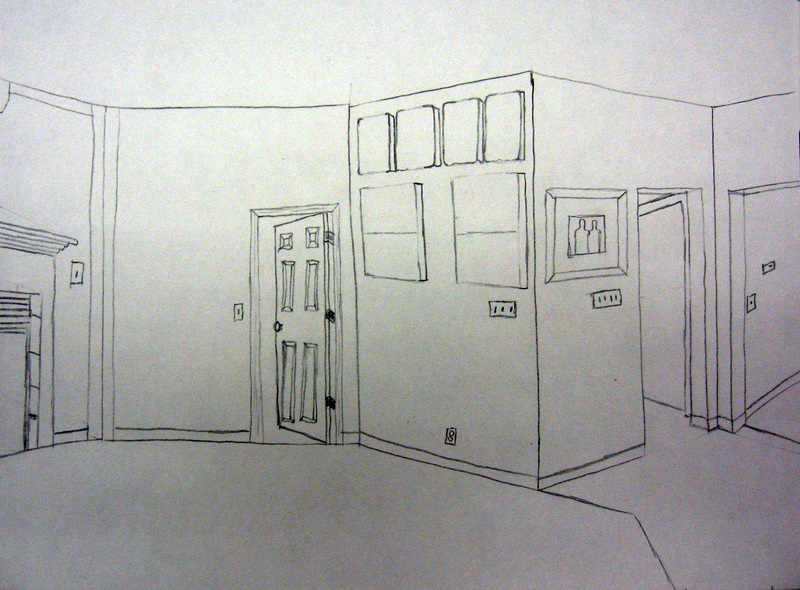 Everyone practiced this skill by drawing an interior room. We learned that objects overlap in space and get smaller when distant. We learned that objects became blurry and less clear in the distance and that all these things enhanced depth in a drawing. 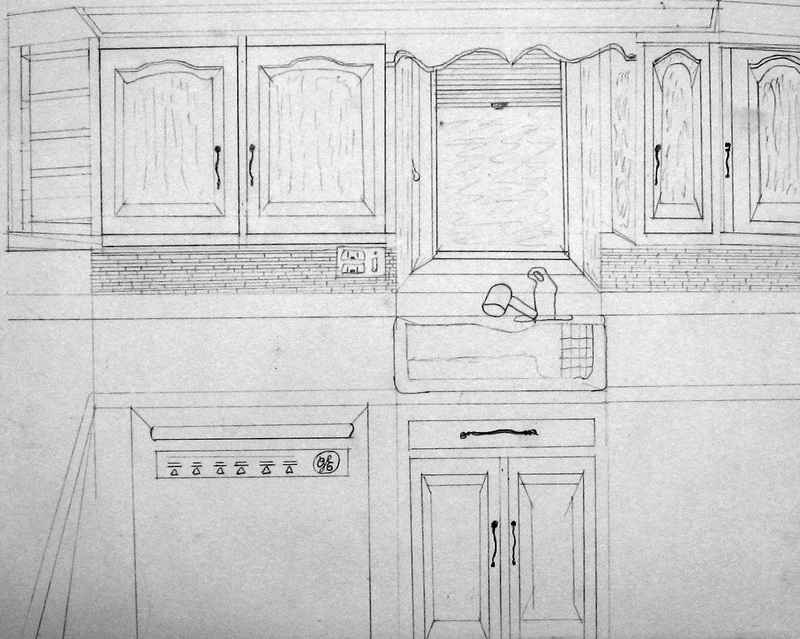 This helped us to get our drawings into perspective and to become more believable. On the 4th week we began to study value. We, first, studied the different ways we could shade and make marks; side of pencil, pointillism, crosshatching, squiggles and lines rendered side by side. 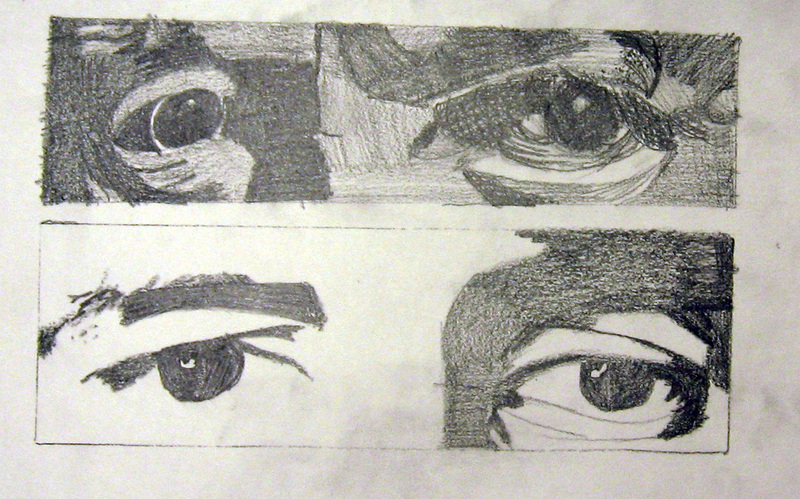 We used photos of strips of eyes to practice shading in the value shapes in medium and dark tones, leaving the white of the paper for our lights. We also cut a colored photo into strips and studied the value changes in color by translating the shapes of values we saw into graphite. 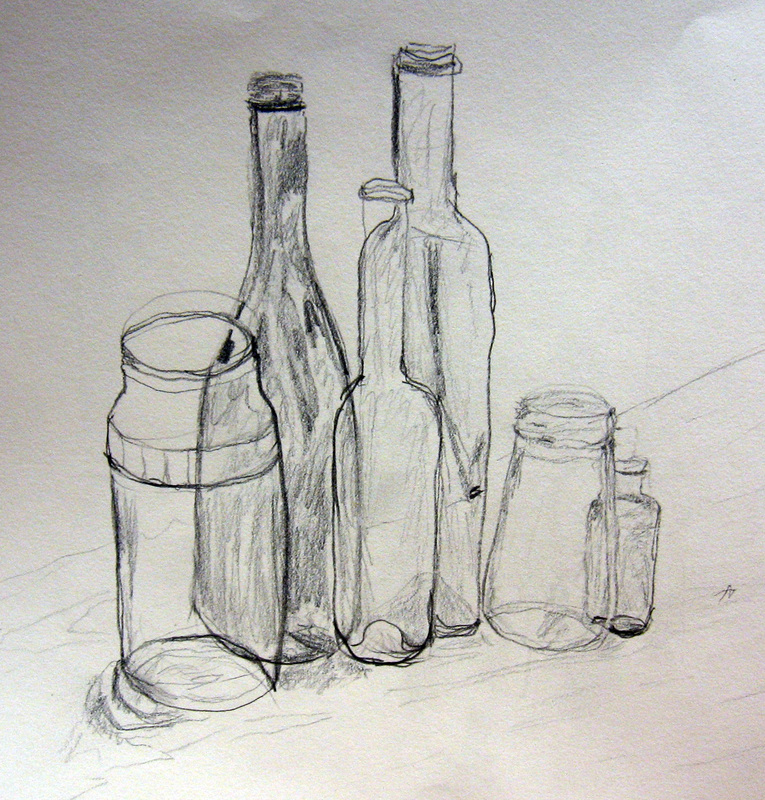 We practiced drawing and shading clear glass objects from life. 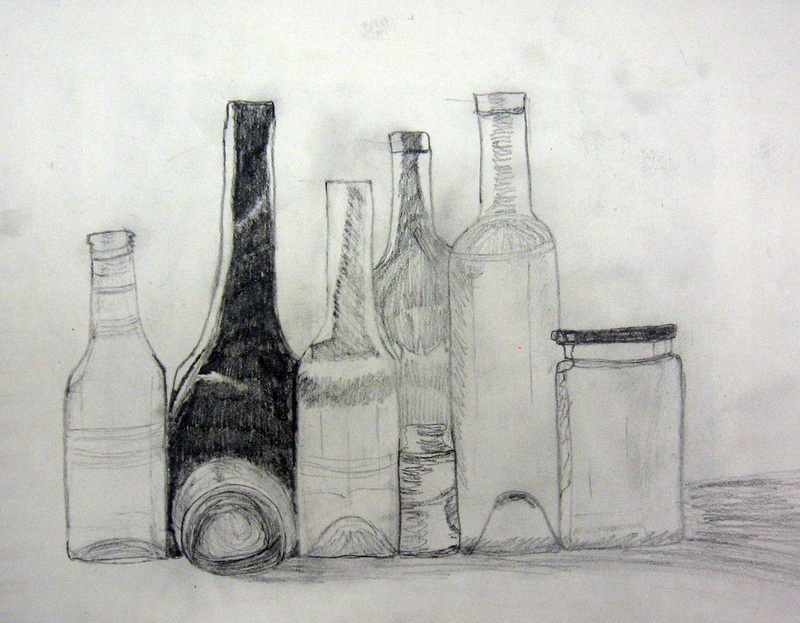 Note how this artist used different pencil marks to indicate the contours of the bottles. We learned to grid a photo and transform the format of the photo and the grid onto our drawing paper. 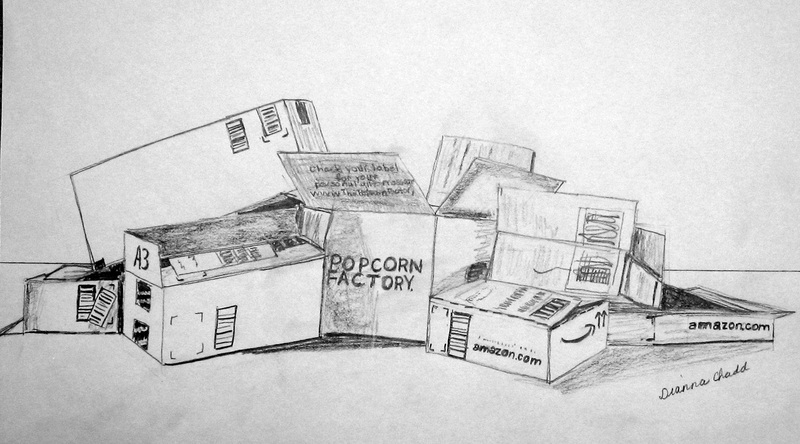 We used all the skills we had learned to draw a still life of a pile of boxes. 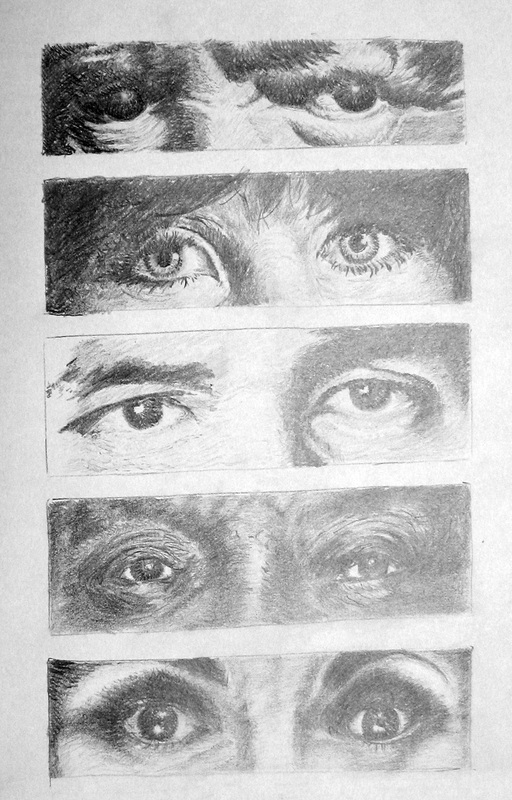 Viewers can enlarge any of the above drawings by just clicking on them. 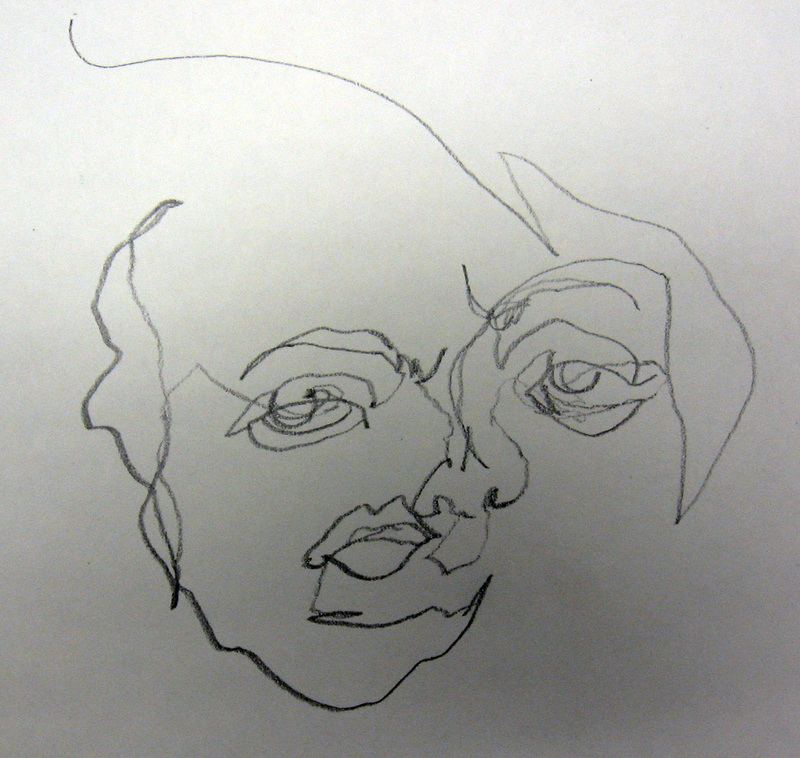 We began this drawing class by learning to “see”, drawing objects, blindly, with what is called blind continuous line. We, then, drew continuous line drawings while looking, paying careful attention to the cross contours in our subject material. We studied negative space and began to recognize when we could use the shape and space behind an object to help us describe the subject. The students worked very hard to begin to see perspective and to measure the angles of lines with their pencils. They used a corner of a room as their subject. During the fourth week, they cut photos in strips and practiced laying in three values. They worked from black and white as well as color photos to do this. 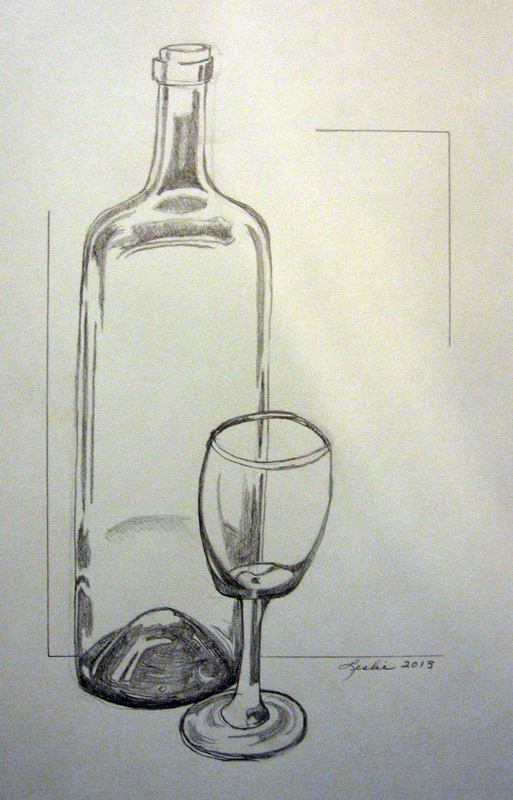 They studied the values they saw in a glass, still life study. They learned to grid a photograph and measure and enlarge that photograph by creating a proportionate grid on their drawing paper. They studied drawing their self portraits. 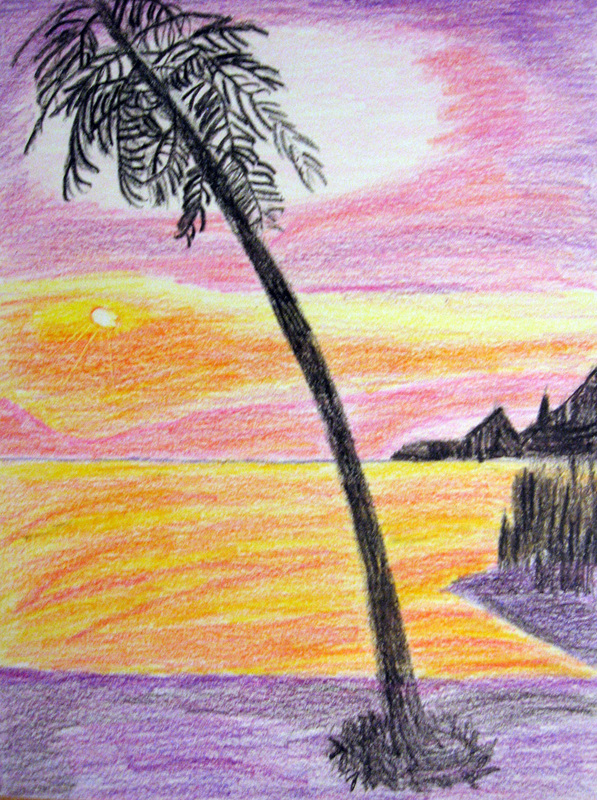 If you wish to view a larger selection of their drawings you can find them by clicking here or by scrolling to the top of the page and clicking on the small label Student Art: Beginning Drawing. If you click on each drawing, they will enlarge. Thank you to all the fine artists who took this class! 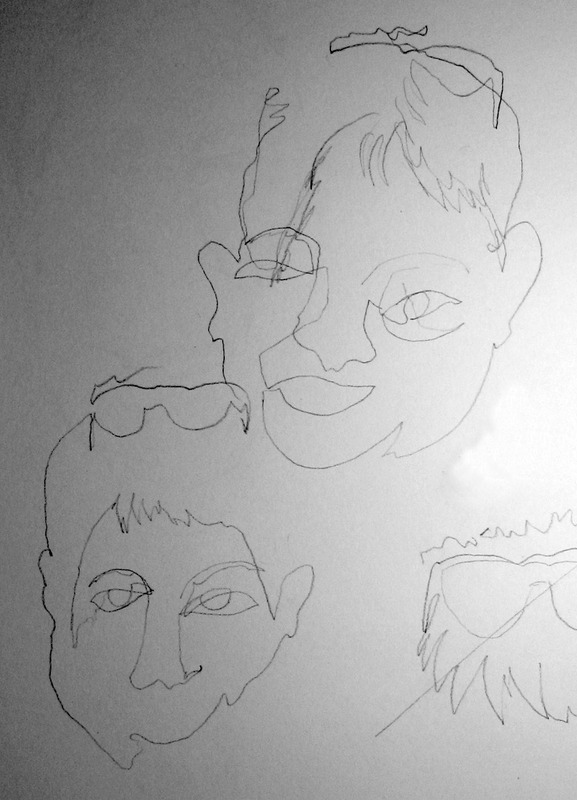 Revisiting Blind “Selfies” and New Student Art! 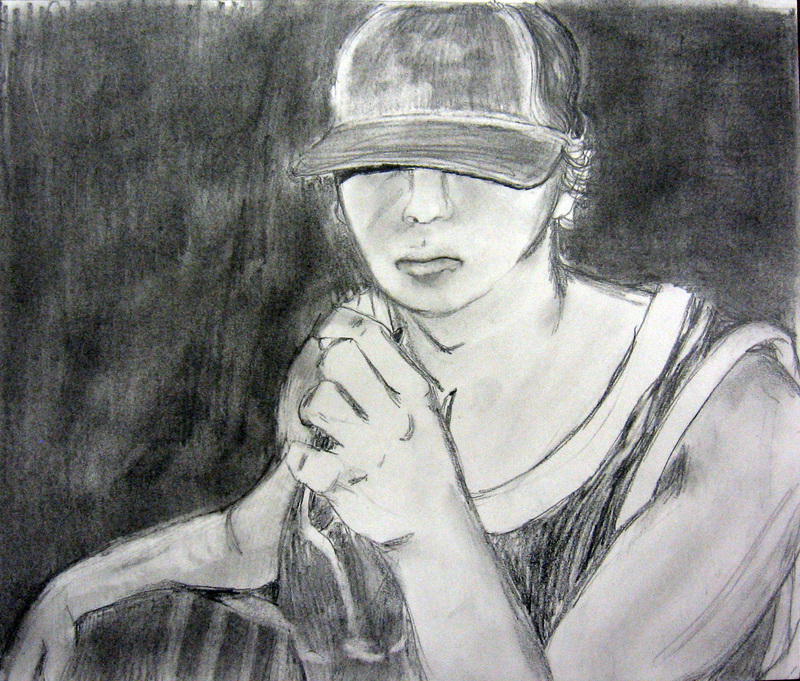 The first Beginning Drawing class of this year has ended. 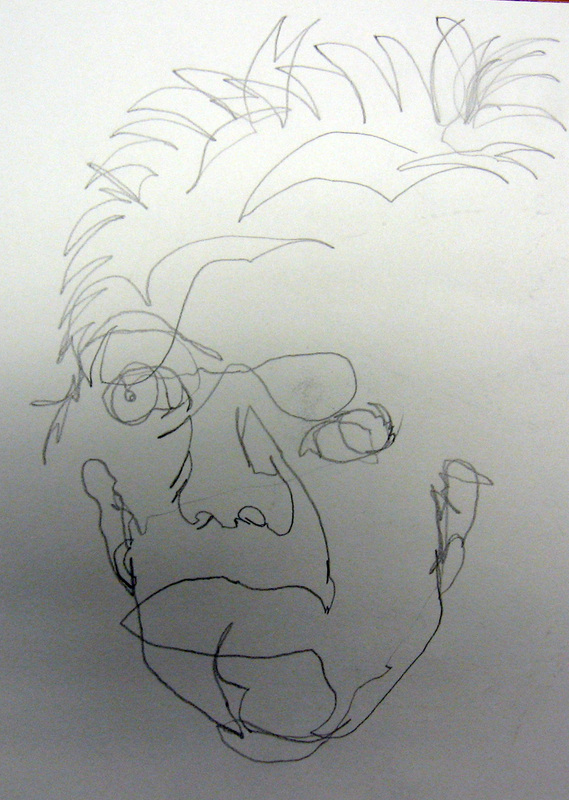 I can’t resist posting these blind continuous line “selfies” that they learn the first night of class in order to get out of their left brain and really begin to “see” and feel the contours of a subject. There is such honesty in them as I know many of you understand. These students worked hard through six weeks of learning to use line and value. 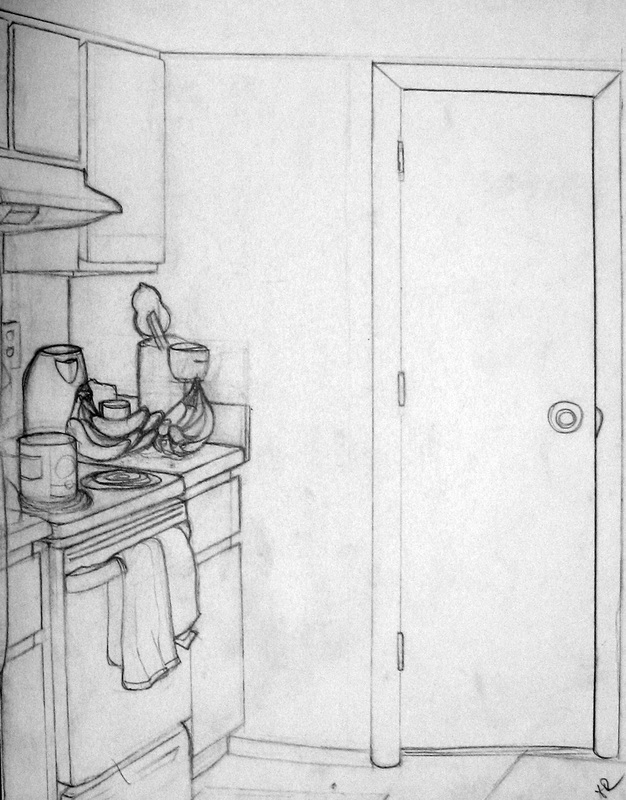 They studied negative space, perspective and cross contours, also. They learned to use their pencil to determine angles and measure length. They began using plumb lines, practiced gridding a photo reference and learned how to crop for scenes and subjects for a center of interest. If you would like to view more of their work, I have devoted a page to that. You can access that gallery by clicking here. …or by clicking on the Beg. 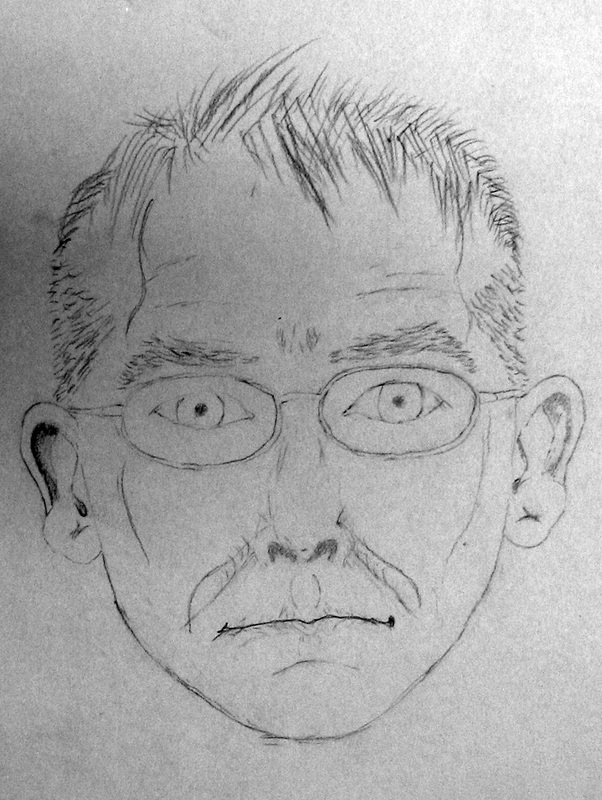 Drawing page at the top of this blog. Thank you to all my students who allowed their work to be posted here! 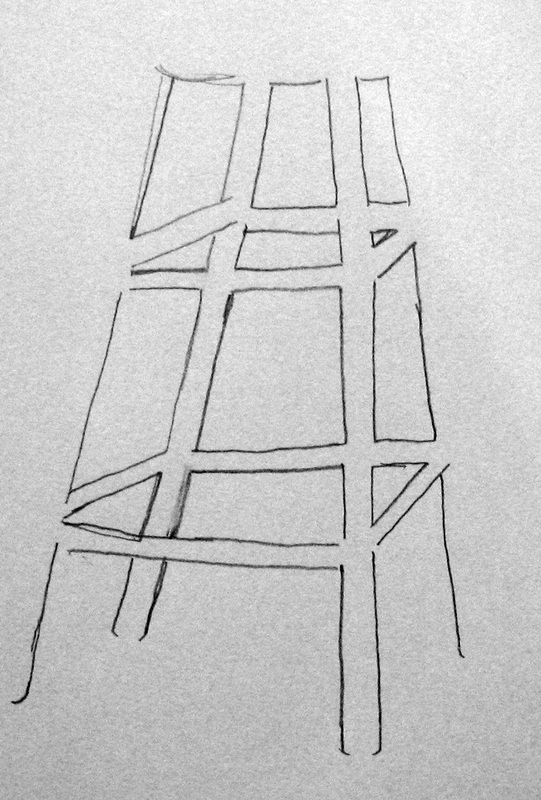 The above three drawings were drawn without looking at the paper. 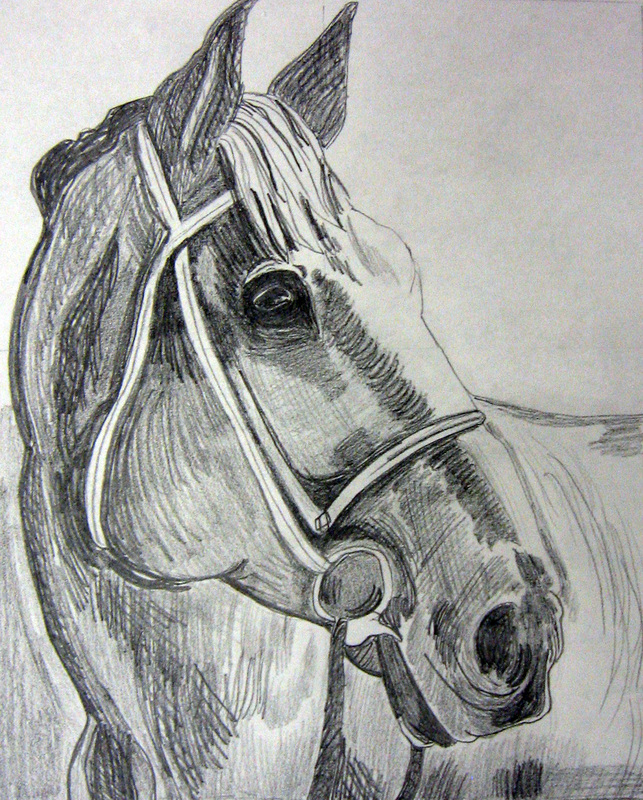 It is the first skill my beginning drawing students learn. I am always amazed at the ability we have to actually feel the surface of what we see and transpose it to the paper with just a few directions. 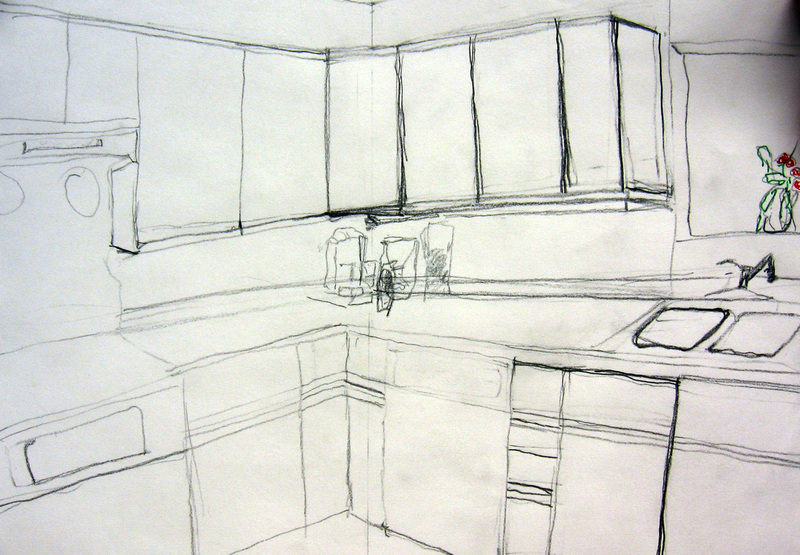 In class, the students learned blind continuous line, continuous line, negative space, one point perspective, cross contours, value and gridding. They worked from both live objects and photos. 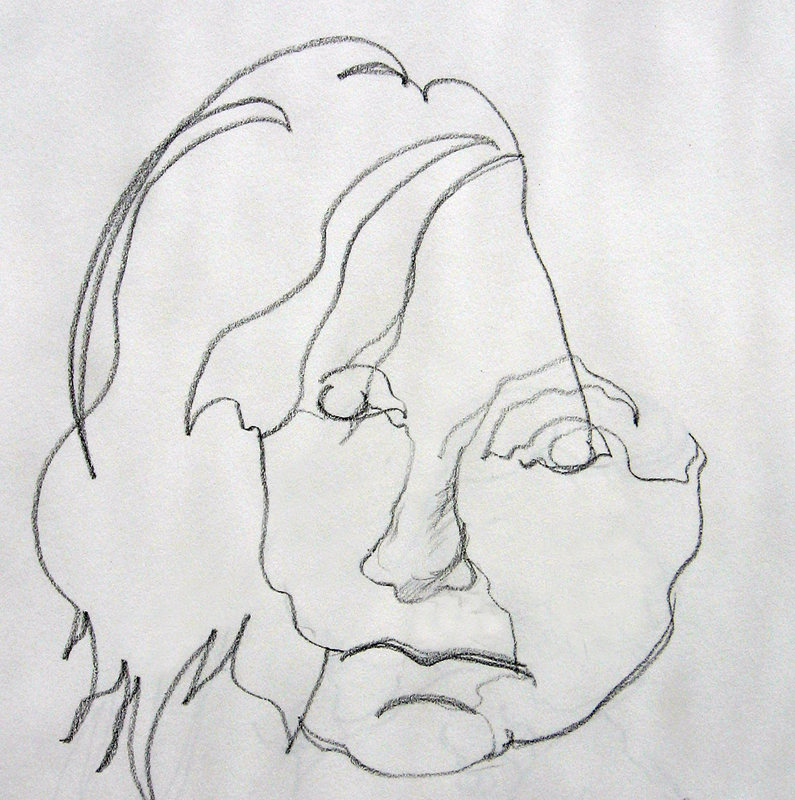 My main goal was to help them to see and then feel the contours and decipher the angles and values of what they see. 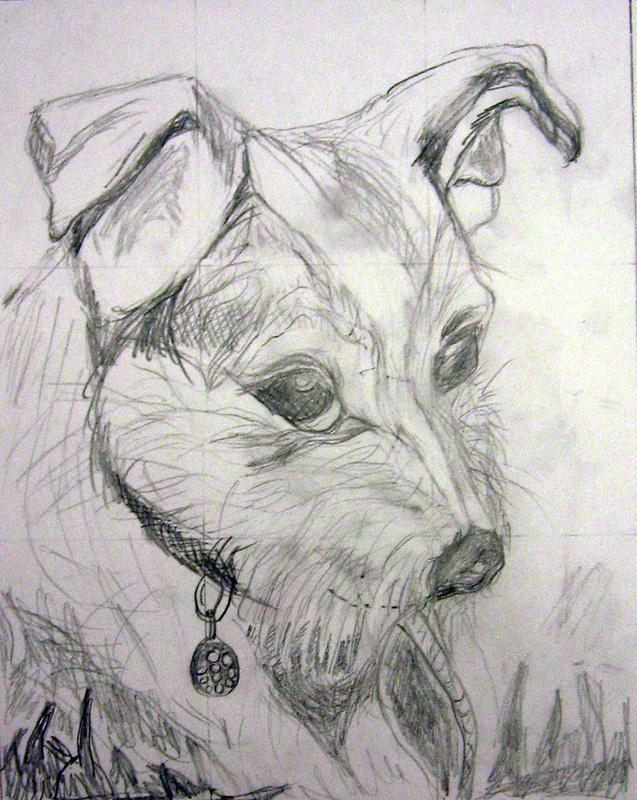 This class was a joy to teach and it is my hope that they continue to explore drawing and art in the future. 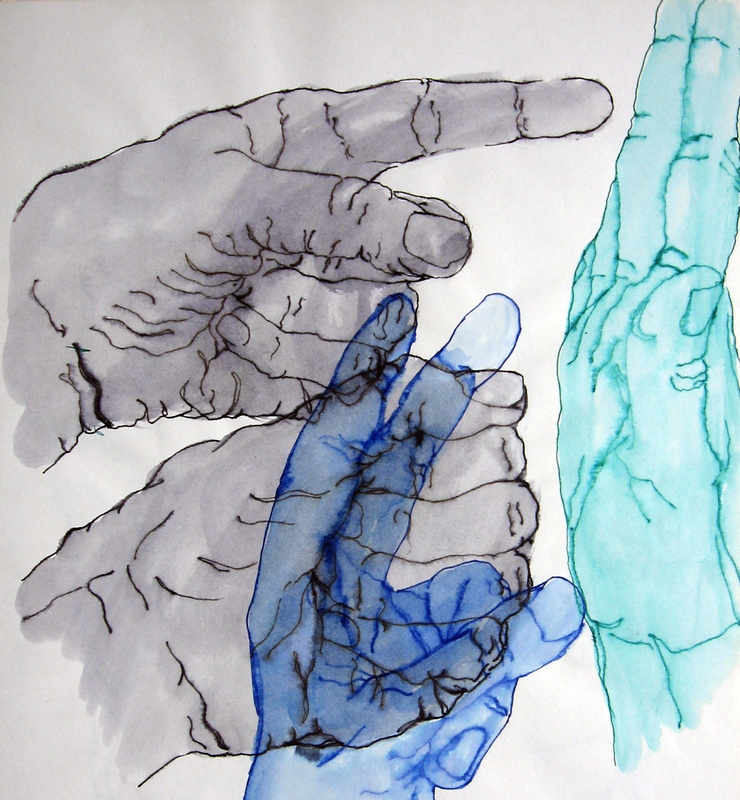 If you would like to view a gallery of their work this last six weeks click here or the link at the top of the page titled “Student Art: Beg. 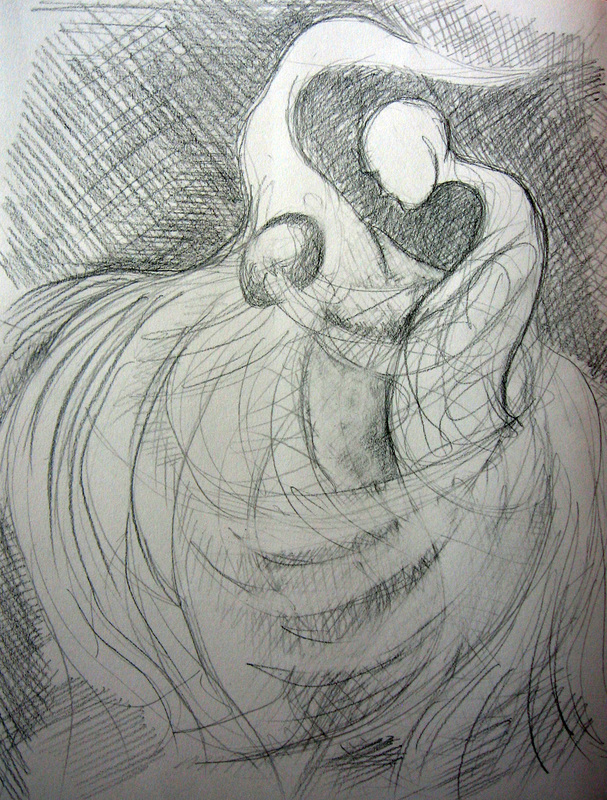 Drawing”. We cut strips and traced the format on our paper and chose values, light medium, and dark to the patterns of value we saw. 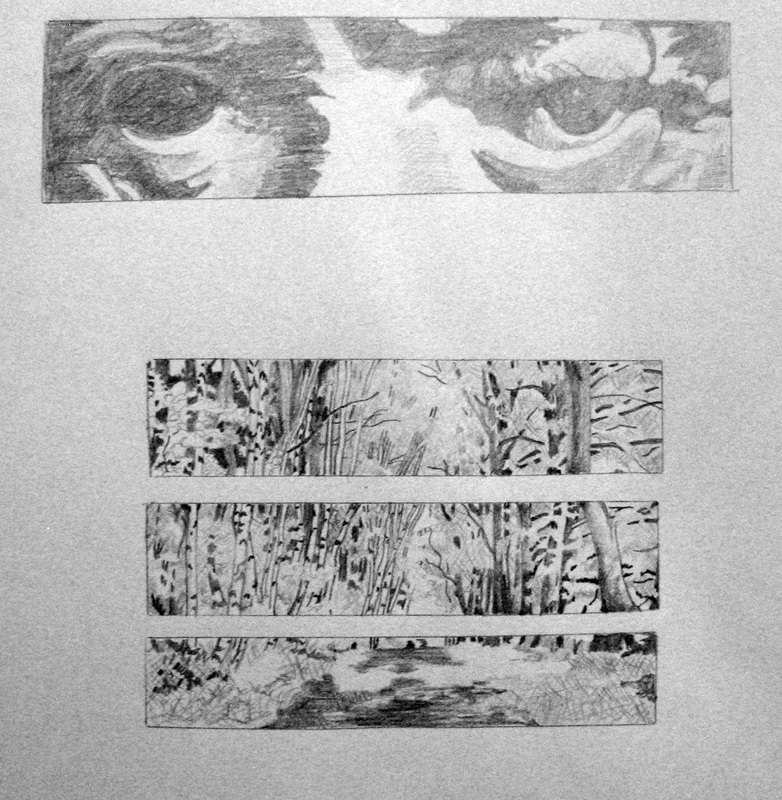 The above drawings illustrate some of the work my beginning drawing class has been working on in the first four weeks. We began with blind line drawings and worked our way through contour line, negative space, value, perspective and are even working at drawing our reverse images in a mirror. All the above drawings are either demos from class or examples I drew to share as examples. 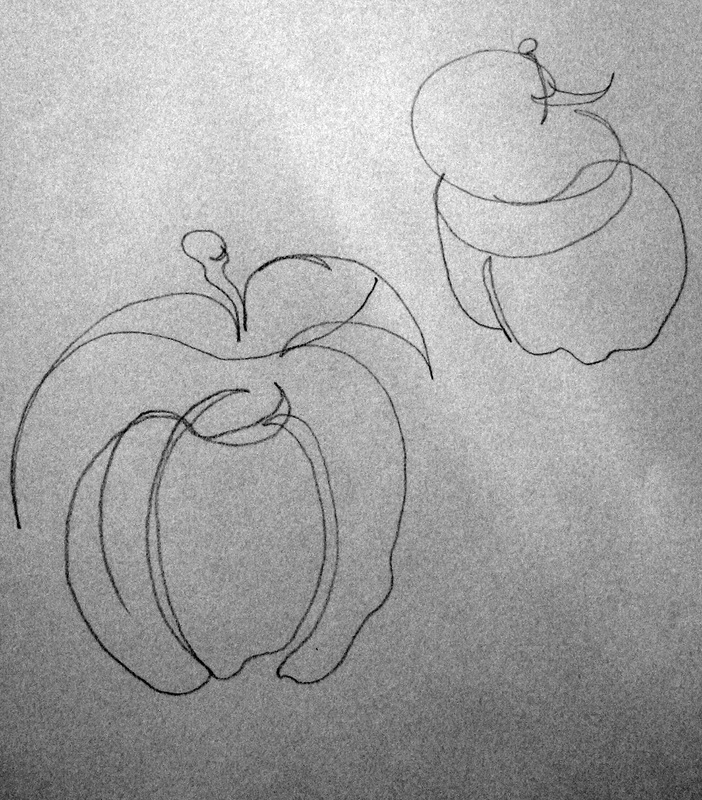 Every year, I teach a beginning drawing class and am reminded about how important it is to learn to “see” and to begin to feel the curve and shape of a form. My favorite way to draw is like the above picture of a father and daughter. 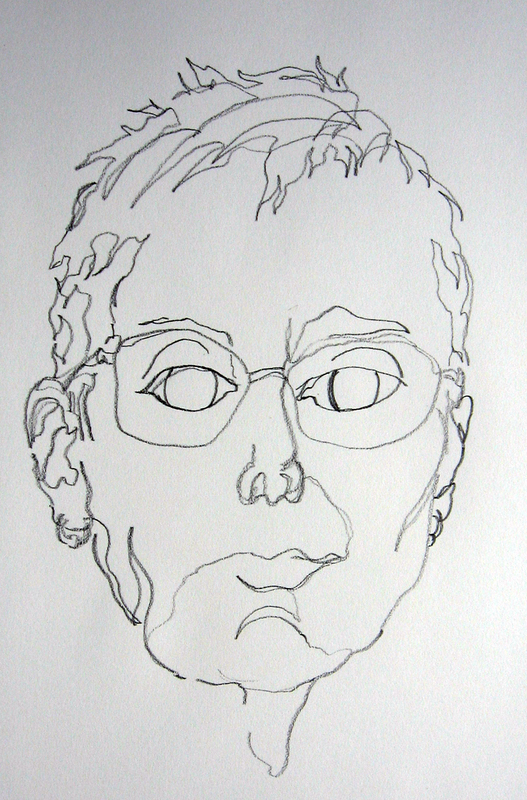 I begin with one line and pretend I am drawing across and around their form, making choices, all the time, as to what bumps my pencil up or down or makes it curve and circle. It took me a long time to learn that every image I create may not be perfectly proportionate but that it would have some truth of the reality of the subject I chose to see. 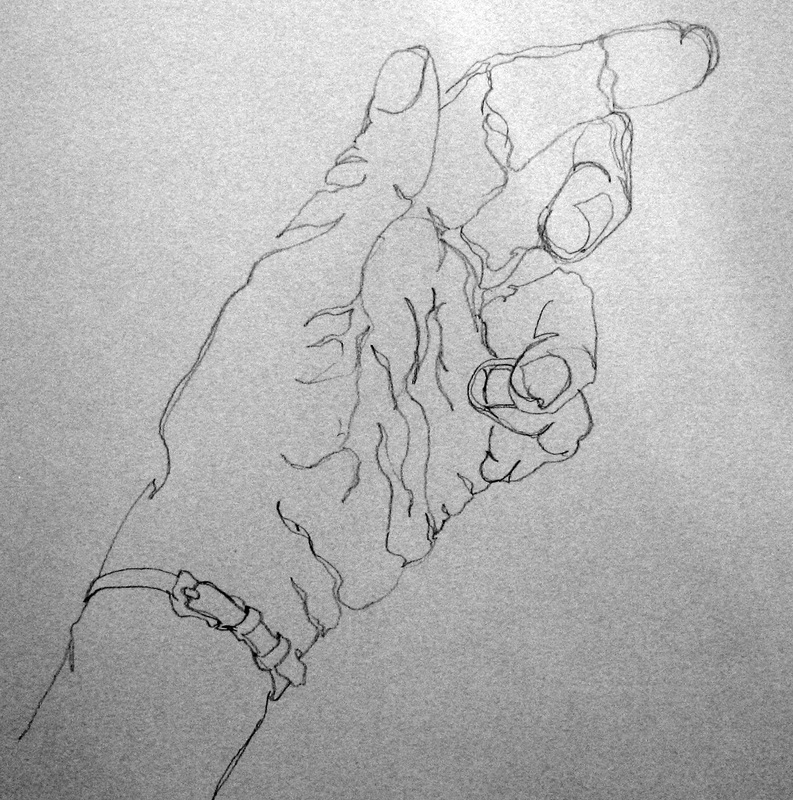 I think that is the real joy of being able to draw and anyone can draw, you know……..
My students begin by drawing blind line drawings of hands and faces and objects. They are instructed to feel the form and to pretend as though the pencil is touching the surface of the object they are drawing. They are instructed to include cross countours and move their pencils in arcs where the form bulges out and would change the form of their line. All of this is done while studying the form and not looking at the paper. This allows us to turn off that left brain that wants to tell us how ugly our drawing is and allows our right brain to “see” more intimately and encourage our hand to discover the true shape of things. 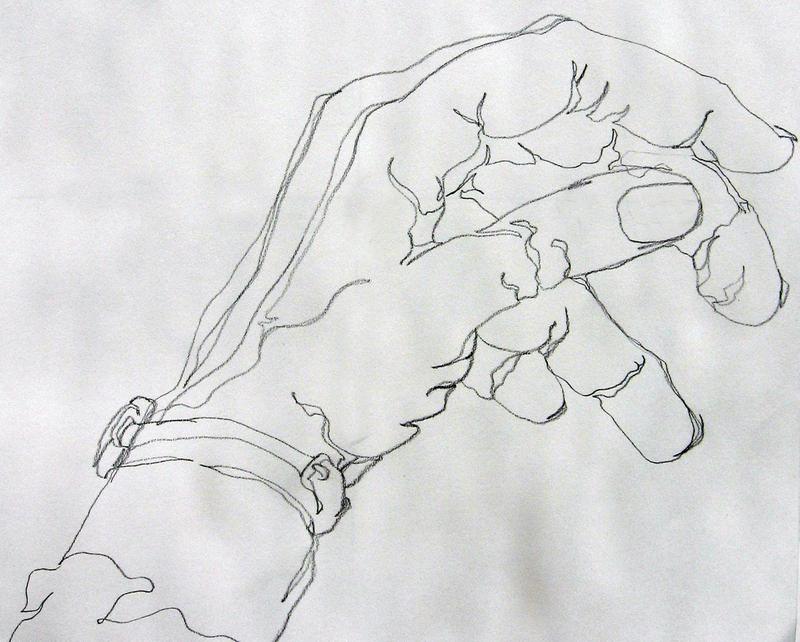 Next we draw continuous line drawings while studying an object, in the same manner but we are allowed to look back and forth from object to the paper. 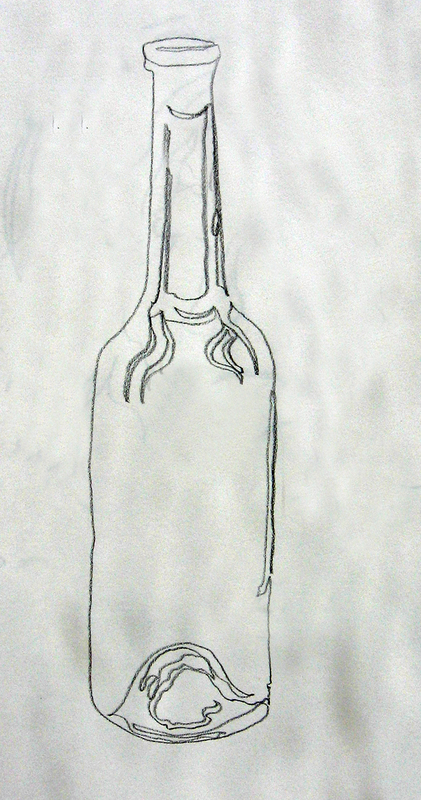 continous line of a bottle. We note where we moved into a form and crossed over it and included indications of cross contours in the forms we created like wrinkles around the joints of the fingers and highlights in a clear glass bottle. 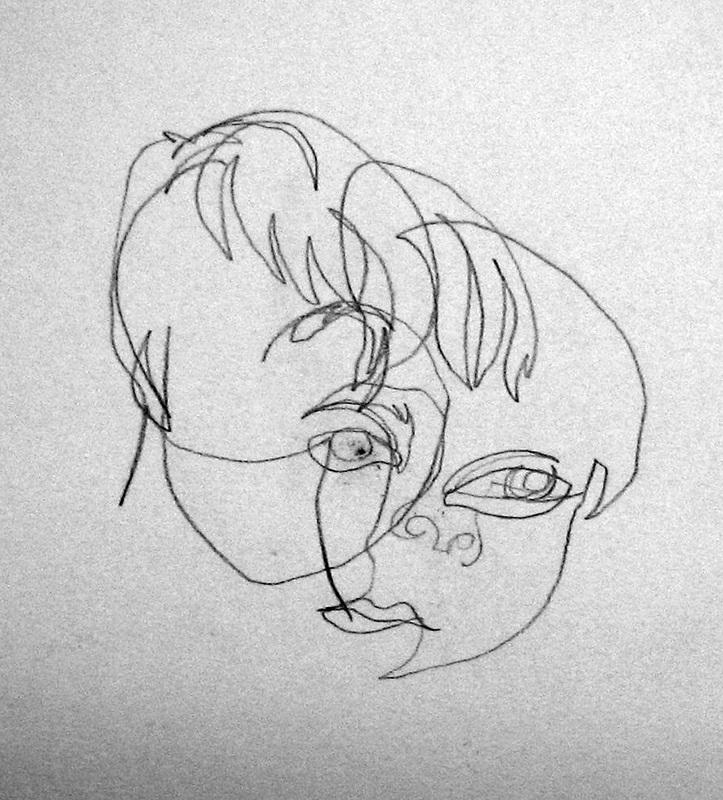 We, then, begin breaking our lines and draw, in contour line, the ghost of an object or objects without values of light, midtone and darks. Note that the green hand is an image of my right hand. 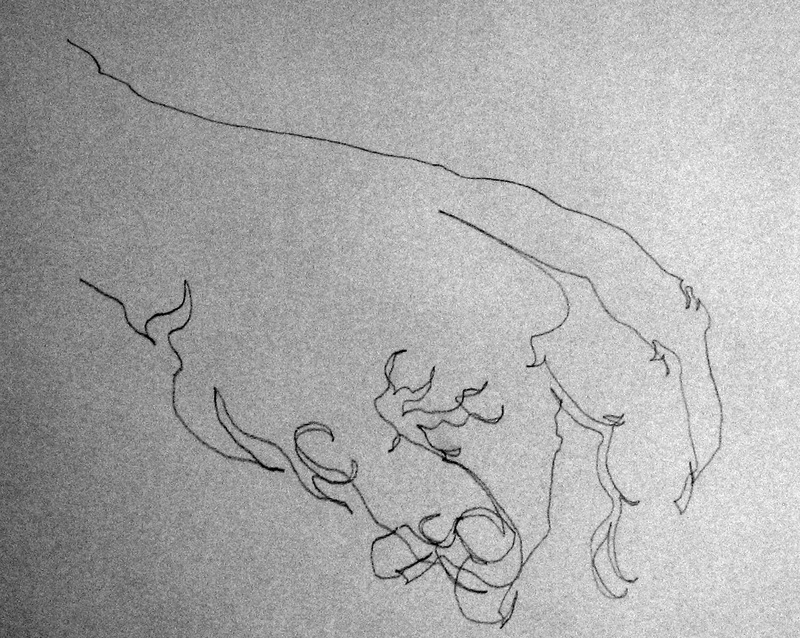 I drew it with my non-dominant hand (left). I have found I can draw as well with my left hand. It just takes me LONGER. 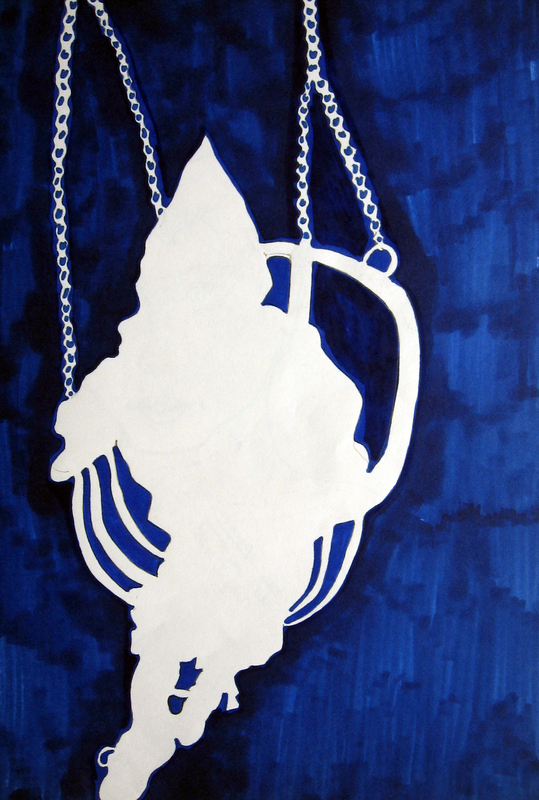 Next, we studied the negative space surrounding something and learned we could come up with the image, itself. 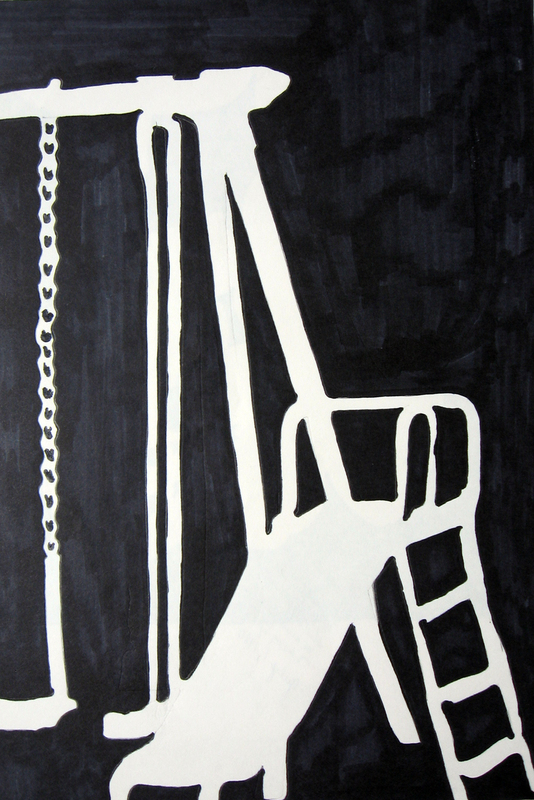 ….and we could always use negative space to bring our positive object into a more proportionate drawing. Now on to value and perspective Yay! 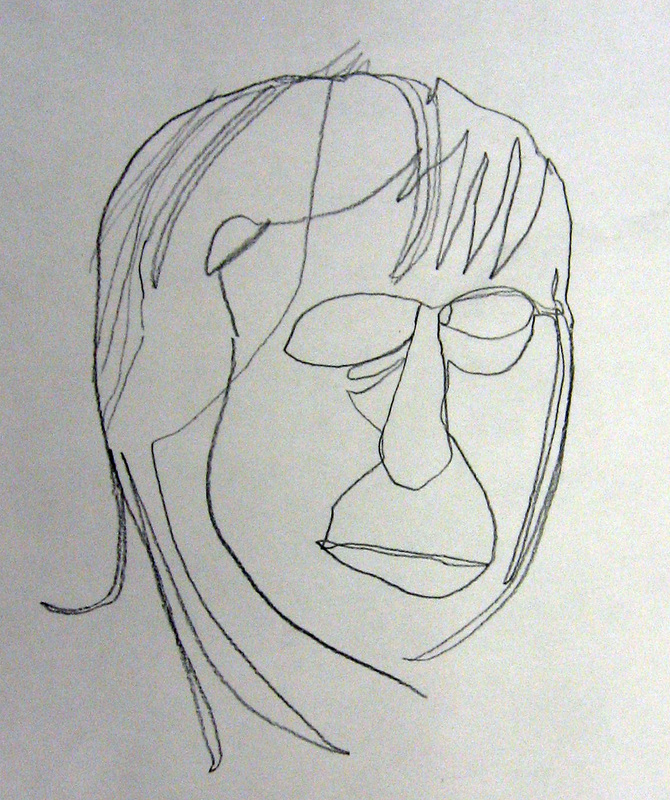 We studied Blind line contour. 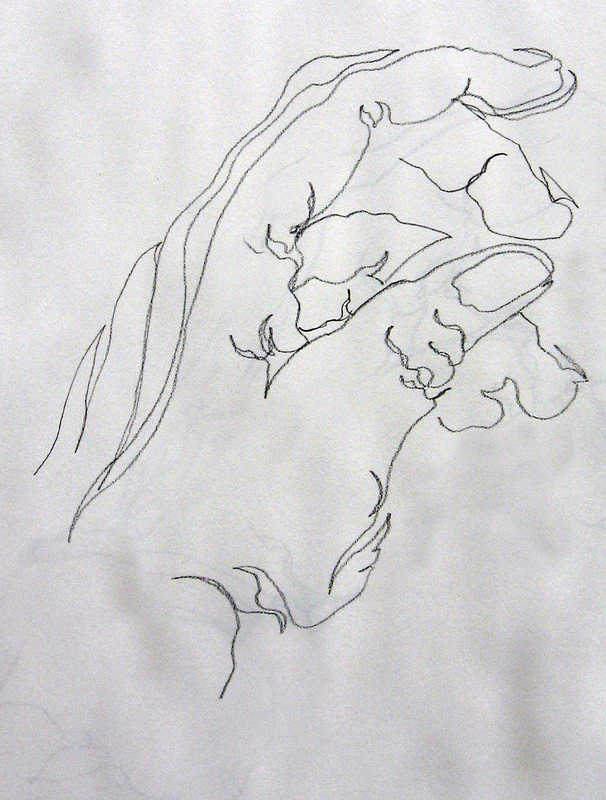 We studied drawing in one continuous line as though we were feeling the edges of the form with the point of our pencil. We practiced drawing cross contours to describe form. We learned to see and use negative space; the space and shapes around a form. We learned about and practiced perspective and how to use our pencils to measure distance and determine angles. We talked about different marks we could make to describe values and form. 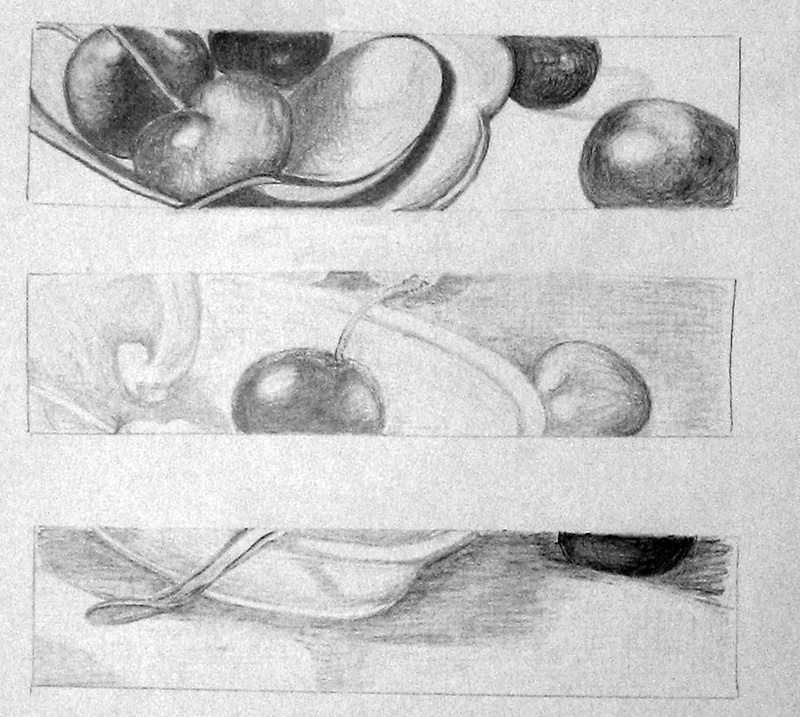 value studies we drew from still lifes illuminated by a light source. 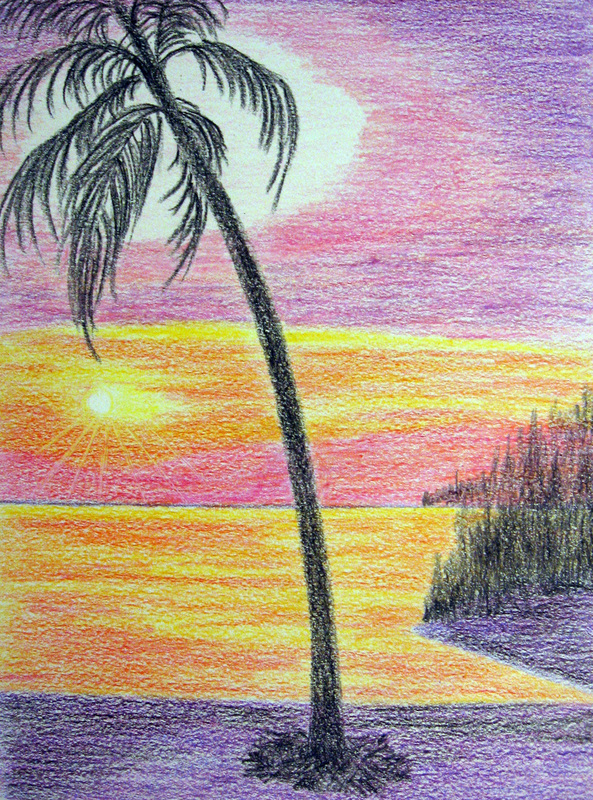 Last night we finished the above class in beginning drawing. 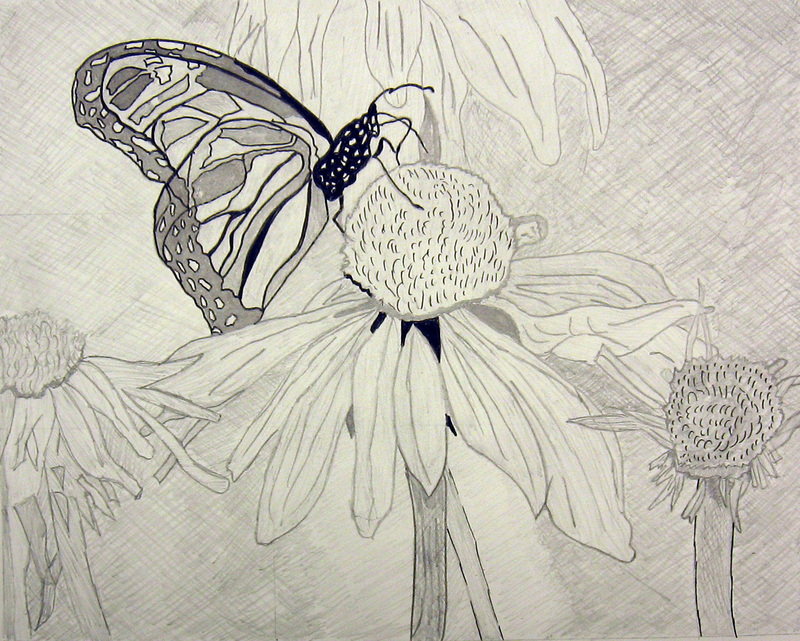 You can view the above drawings and more by visiting the Student Art 1 Page here. Thank you to all those who participated in this class! 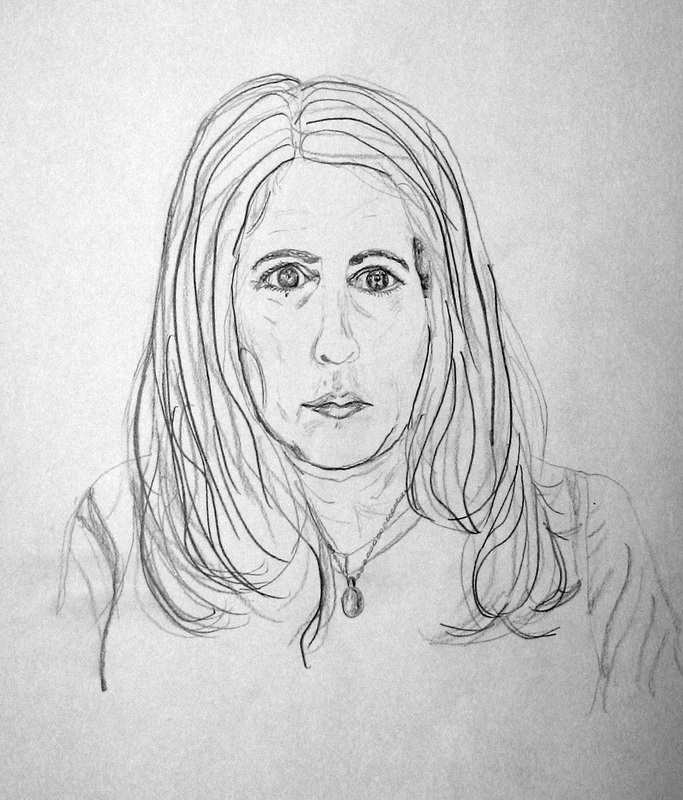 I have long been interested in automatic drawing. 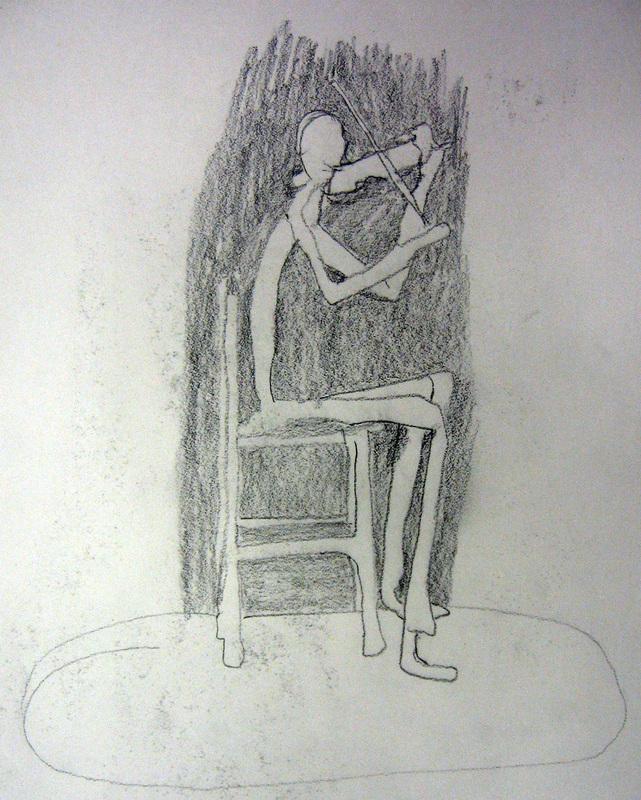 A while back Chris Carter had a post about automatic drawing and came up with this on a sleepless night. I finally decided to give it another go. As busy as I am, lately, it is something I can do when I have a moment of time. The above was my first attempt. I have no idea what the egg or the bird signify. 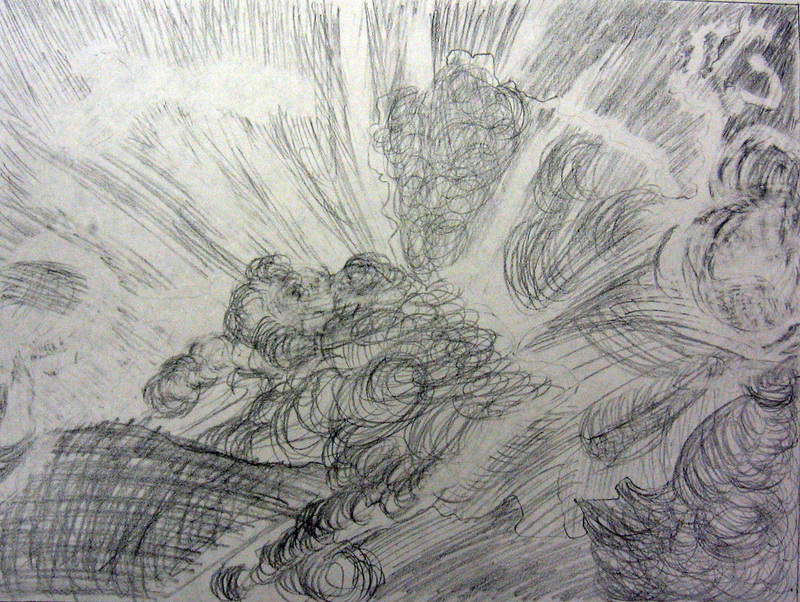 The book I read on the subject of automatic drawing said to start by making marks on your paper. They can be any marks (swooping lines, crosshatches, dots). You can use the side of your pencil and your eraser. The idea is to draw. It was suggested that you follow the shapes of what you are creating and can turn the format and view it from all angles as you work your drawing. 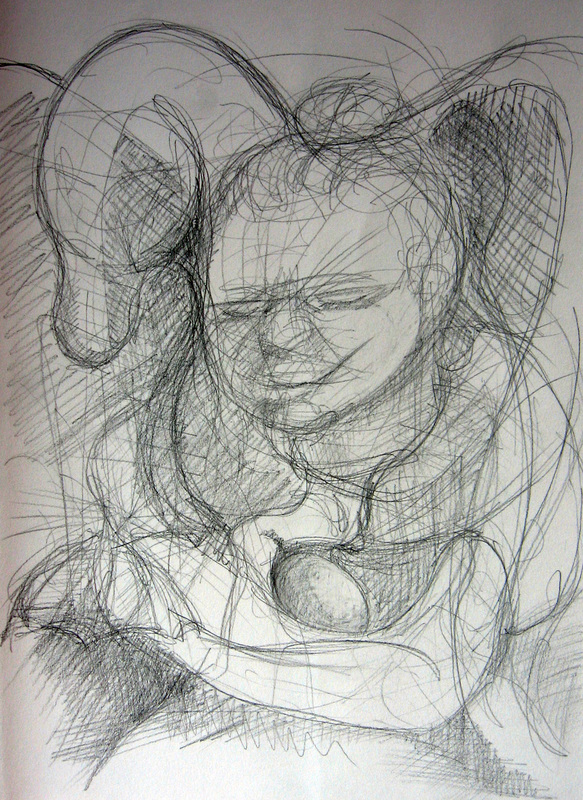 As you begin to see something appear, shade and draw to bring that image to the foreground. I have a tendency to be judgemental, so I have to keep reminding myself to let go and let it happen. 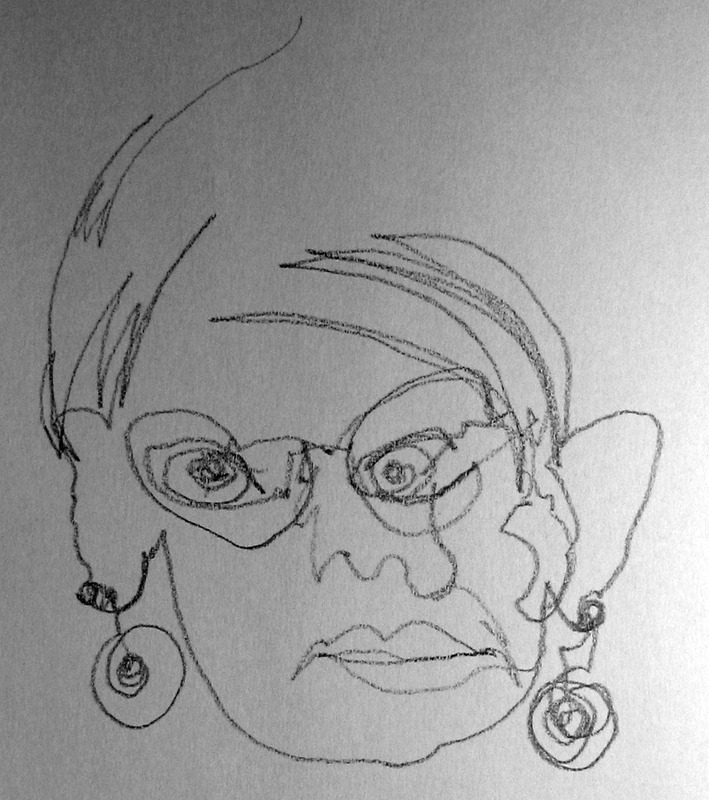 This was my second automatic drawing. This one actually moved me as it began to appear. I imagined a fairy- like figure shaping the landscape. I searched for what she might be fashioning. I stopped, prematurely, because I wanted to allow that landscape to become whatever the viewer wants to imagine it to be. I may try and watercolor and rice paper collage this one. I wonder if I can maintain the mystery in paint. I will post it if I do so. Back to another egg and figure and bird. What is this? I can assure you I did not set out to draw them. 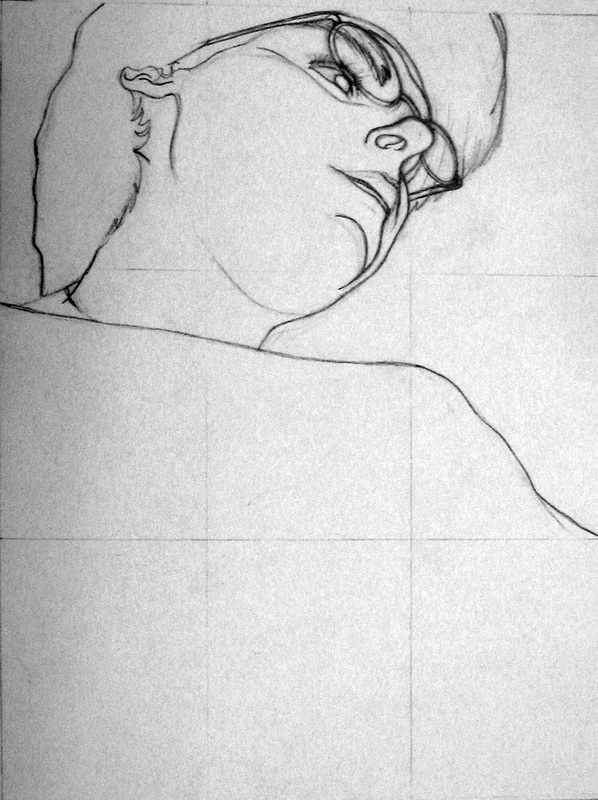 As it began to appear in the lines, I even had to erase back along the bird’s breast to bring the figure I saw forward. I think I’d like to paint this one, also. If any of you try this, I’d really like to see what you come up with. 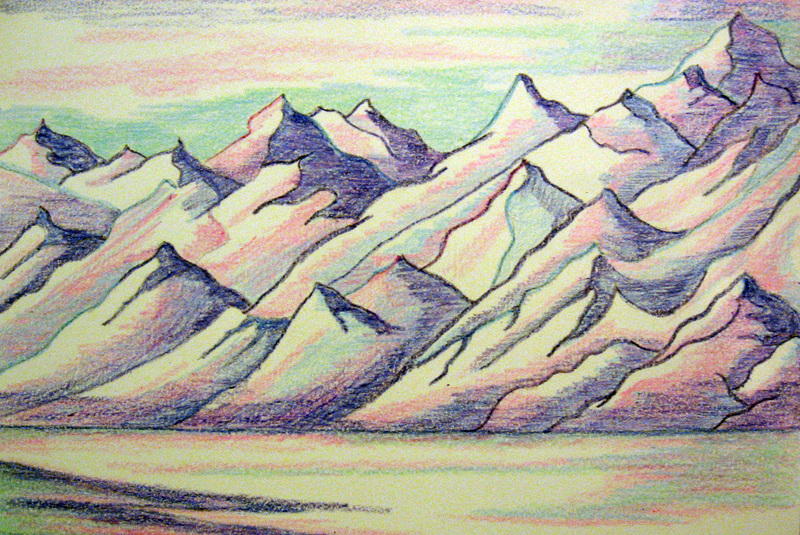 I find it a great way to free me up and suggest possibilities for paintings as well practice my drawing skills.